The 220-mph high-speed line could be built alongside Interstate Highways. The heart of our big-picture vision is a 220-mph high-speed line that will connect Chicago, St. Louis, and Indianapolis and also serve O’Hare, Champaign-Urbana, and Springfield. It will be a newly-constructed, electrified railroad dedicated to high-speed passenger trains and lightweight, high-value freight. Highways and local roads will go over or under the tracks, just like an Interstate Highway. At University Park, it will connect with CrossRail Chicago for access to Chicago and O'Hare. The line will create a new relationship between major cities like Chicago and St. Louis. One study found that 220-mph trains from Chicago to St. Louis, leaving every hour, would attract more than 10 million riders every year, or 10 times the current ridership for trains traveling 110 mph. But those city-to-city numbers barely begin to capture high-speed rail’s value. It’s the ripple-out effects that are truly paradigm shifting. The Chicago to St. Louis high-speed line will be the backbone of a statewide network that opens up economic opportunities for people in communities of any size and allows them to stay connected to their hometowns. It will also boost ridership on local transit systems, making them more viable, and improve access to O’Hare for all of Illinois. Illinois already has a dense railroad network. Segments of 220 mph high-speed line will connect seamlessly to the existing tracks, creating a robust statewide network of fast and frequent trains that run at various speeds. Trains from Chicago to Carbondale will make the trip from Chicago to Champaign at 220 mph, for example, then finish the run on existing tracks at up to 90 mph. A rider going from Rockford to Springfield will ride an Amtrak to Chicago, then catch the high-speed line for a 90-minute ride to Springfield. The upshot is that more trains will be able get to and from more places, faster. As new segments of high-speed line are added, and as public transit options like Metra are improved and expanded, the network will become denser. 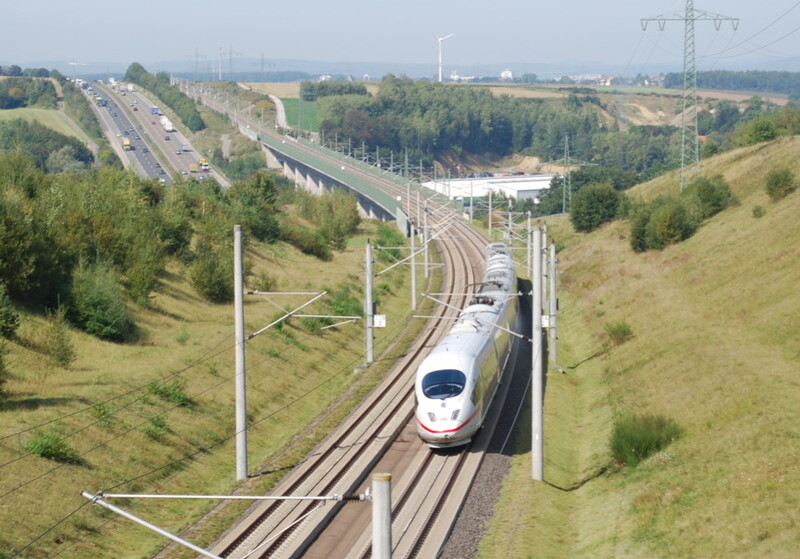 Towns and cities not directly served by a high-speed line will become more accessible, giving their economies a boost. Tell Springfield to make high-speed rail a priority in the capital bill. The University of Illinois study team believes that their ridership analysis was conservative and recommended a more detailed study. A 2013 study conducted by the University of Illinois showed that 220-mph trains are feasible. A 2013 study conducted by the University of Illinois estimated the cost of the full system shown at $30 billion. The Illinois portion only is $24 billion. These are high-end estimates. The U of I study assumed the maximum possible construction cost of all-new infrastructure from Chicago to St. Louis and Indianapolis. Their proposed right-of-way is fully elevated and grade-separated from roads and other railroads. Their estimate includes some particularly expensive segments, like new tunnels and platforms under Chicago Union Station and a new bridge over the Mississippi River. These segments are not immediately necessary and could be built in later phases, as discussed below. The study performed an initial analysis of 12 potential financing scenarios using the Simple Discounted Cash Flow method. All scenarios generated operating surplus. None would require an operating subsidy. The portion of capital costs that could be privately financed from this surplus ranged from 8% to 21%. The figures above are based on a study conducted by the University of Illinois for the Illinois Department of Transportation and similar studies conducted for the Midwest High Speed Rail Association. You can read those studies here. The U of I study cost is based on building the entire system at once, but working in phases would prioritize lower-cost, high-impact segments first. These segments can be placed into service as they are completed, allowing gradually improved service before the network is complete. This phased approach is how successful high-speed rail systems around the world have been built. The first segment of high-speed line connects to and extends the existing railroad network, immediately improving all service that travels over that segment. As additional segments are completed, more trains get faster to more places. This strategy, called the Phased Network Approach, allows high-speed trains to serve established downtown train stations via existing tracks. It also means cities not on the high-speed line still benefit from it. Tell Springfield to include fast trains in the capital bill.